The Alcatraz Federal Penitentiary was a maximum high-security federal prison on Alcatraz Island, 1.25 miles off the coast of San Francisco California, which operated from 1934 to 1963. With its high security and its location in the cold waters and strong currents of San Francisco Bay, the prison operators believed Alcatraz to be escape-proof. Of the 14 escape attempts, none were proven successful. The prison cells measured 9 feet by 5 feet and 7 feet high. The cells were primitive and lacked privacy, with a bed, a desk, and a sink and toilet on the back wall, with few furnishings except a blanket. One section of the prison, D-Block, housed the worst inmates and five cells at the end of it were designated as "The Hole", where badly behaving prisoners would be sent for periods of brutal punishment. Alcatraz was designed to hold prisoners who constantly caused trouble at other federal prisons. The prison housed some 1,576 of America's most ruthless criminals including Al Capone and "Machine Gun" Kelly. The life of a prisoner in the 1700s was very different from that of today's prisoners. In the past, prisoners were treated as animals and considered less than human because of their lawlessness. They were made to right the wrongs that they had committed through physical pain, such as mutilation, branding, and torture. The accused and convicted were deprived of their liberties and declared slaves to society. Prisoners were assigned a small cell made of hard walls, with floors covered in dirt and rodents, and with a bed in the form of a hammock, a bench, or a mat on the floor. For meals, prisoners were barely fed, often with just small rations of bread and water. Many times the prisoners died of starvation and dehydration. Prisoners today have better conditions than in the past. Cells contain a bed with a mattress, a sink and toilet, and possibly a desk and stool. Now, prisons are seen as rehabilitation centers. Prisoners have opportunities to participate in rehabilitation programs, are given more legal assistance, and are supported by better trained staff. Despite this, today’s prisoners face more violence, are more restricted, and deal with overcrowded conditions. During the American Civil War, over 109 Union POWs broke out of a building at Libby Prison in Richmond, Virginia in February 1864. All but 50 reached Union lines. Infamous gangster and bank robber, John Dillinger, FBI’s “Public Enemy #1”, escaped from the “escape-proof” Lake County Jail in Crown Point, Indiana on March 3, 1934. Newspapers reported that Dillinger had escaped using a fake gun made from wood, blackened and shined with shoe polish. 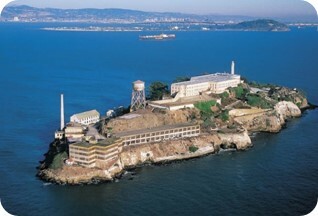 American criminals Clarence Anglin, John Anglin, and Frank Morris escaped Alcatraz Federal Penitentiary on June 11, 1962 by crawling through holes cut in their cell walls, climbing to the roof, and using an inflatable raft fashioned from raincoats and rubber cement. It was never determined by the FBI whether they succeeded in their escape or died in the attempt. James Earl Ray, the convicted murderer of Martin Luther King, Jr., and six others escaped from Brushy Mountain State Prison in Tennessee. Ray was recaptured after two days of hiding in the mountainous forest surrounding the prison.